The Doctor is excited when he hears a voice coming through his radio speaking in English and materialises on the planet Vortis. He puts on his breathing apparatus and atmospheric density jacket and sets out across the landscape. His observation that the mists and basalt spires of his first visit are not to be seen so he concludes he is on a different part of the planet from his previous visit. The voice on his radio keeps repeating the plea for help, the warning against the Zarbi supremo and the need to warn Earth that he first heard as he came back into real space. He returns to the TARDIS to find some binoculars which he trains on the uncountable 'anthills' - each a hundred feet high at least - which stretch across the plain before him. He sees millions of Zarbi swarming over the hills. He uses the antennae on his walkie-talkie to get a rough fix on where the message is coming from, presumably sent by an imprisoned Earthman, and sets off in that direction. He makes his way between the Zarbi, who seem to pay him no heed. When he thinks he must be near the sender of the message he replies, asking for a landmark to guide him. There is no reply. He makes his way forward and spots something half-buried in the sand. It is a large metal sphere. Assuming it is a space ship belonging to the sender of the message he searches for a door and enters an airlock. When he passes through that into the main part of the ship he finds that the message he has been listening to is being played on a tape machine. Passing further into the ship he finds a room where two figures are lying on a bed. One is a boy and the other appears to be a dead man. The boy, Gordon Hamilton, says that the recorded voice is his father's. when the ship crashed onto the planet the rest of the crew went out to explore. His father was too ill to go and stayed behind. Something they saw outside made them convinced that an invasion of Earth was planned. The Doctor is puzzled when the boy says this. Even assuming that the ship has the ability to travel at several times the speed of light, as Gordon says, and travelled for two years, it has no chance of being even a millionth of the way to Vortis. The boy tells him that there were six crewmen, all scientists, and they left the ship five days earlier. Looking out of a porthole the Doctor notices that many of the 'anthills' are torpedo shaped. The boy tells him that they are space ships. His father apparently has been listening to telepathic messages that say the ships are to be used in an invasion of Earth. The Doctor asks him where he thinks the planet is. Gordon says that it is a rogue planet that has been steered into the Solar System and is currently near to Jupiter. This seems very improbable to the Doctor. He suggests that Gordon is of no help to his unconscious father and that they should leave the Solar Queen and look for the missing crew. On their journey, the Doctor explains that the Zarbi are one of the two dominant species on the planet while their rivals are the peace-loving, butterfly-shaped Menoptera. They come across six Zarbi lying in the sand. At first they think they are dead but on closer inspection it is apparent that they are metal facsimiles of the Zarbi and in each is a dead Menoptera. They remove two of the dead and climb inside to see if they can work out the controls. The Doctor works it out more quickly but Gordon soon gets the hang of it, too. The boy suggests they use the Doctor's walkie-talkie to see if they can locate the crew but, as soon as the Doctor switches it on, all of the Zarbi freeze. He realises that somebody is controlling all of the m and will get a fix on his location if he switches it back on. When the Zarbi start to move again, the pair of them begins to walk, using their metal casings. However, this time they notice that the giant ants are coming in their direction in one vast wave. They are swept along in the wave towards a squat hill with a single entrance. Inside, it is hot and stifling. The Zarbi carry on with a single purpose. They pass furnaces and machinery as well as vast bloated queens and thousands of larvae. They arrive in an enormous amphitheatre where thousands of rows of Zarbi are looking at a stage. On this sits a giant Zarbi as well as a party of Menoptera and a group of humans. These groups are motionless and wear a collar around their necks. One of the Menoptera has had its collar removed and is speaking to the great Zarbi. The Doctor and Graham edge forward until they can hear the Menoptera. It is clear that he is refusing to follow the Supremo's plan: the Menoptera tell the people of Earth that they come in peace while the Zarbi invade and take over the planet. He points out that a fraction of the energy used to get Vortis through space would have made the planet like Earth (but better suited to insects). The Zarbi leader replies by manipulating a dial on a piece of equipment. The Menoptera clearly hears what is being said, though the Doctor cannot because brainwaves are being transmitted. The Menoptera replies that the Zarbi must kill the prisoners, then. He warns that the Menoptera have been building weapons and soon the Zarbi will find that their plans are defeated. The Zarbi's response is to raise a limb and use some sort of electricity to fry the Menoptera. This galvanizes the Doctor and Graham into action. They storm onto the stage and use their robot Zarbi mandibles to lift the hypnotic collars from the necks of the prisoners. The Doctor urges the men to use their weapons on the leader. They pump it full of bullets until it collapses dead. While one of the Menoptera explains how the Zarbi have developed from a social species to one desiring to rule (under the leader's terrible thrall) the men are surprised to see hundreds of Menoptera emerging from Zarbi shells and shepherding the now leaderless ants. The men make their way through the tunnels to the planet's surface and back to their space ship. When they arrive they are pleased to see that Graham's father is looking better. The Doctor asks how the planet happens to be near Jupiter. The Menoptera that have accompanied them say that the Zarbi leader used great engines to power the planet in search of a damp, green world. They say they will fly the planet elsewhere and destroy the engines. One of the men says that cannot be allowed. The purpose of their explorations is to find planets rich in resources with weak inhabitants that can be exploited. He pulls his (empty) gun on the Menoptera but before a fight can begin other Menoptera lift the Doctor up and fly him back to his TARDIS. They tell him that they have heard legends of him and know he is no threat. He enters the ship, wondering what the future has in store for this strange planet. Time-Placement: This is the second visit of the Doctor to Vortis. The Doctor travels to the Crab Nebula, the first time he has made such a lengthy journey in one go. He finds himself in a strange city of squat buildings. He steps out onto the street and finds himself frozen in fear as he surveys the teeming inhabitants. They are of many, hideous shapes and, bizarrely, seem to change size and species as they move. One goes from a three-headed monster to a giant orchid to a spray of liquid as it approaches. Suddenly, a square opens in the wall beside him and he is pulled inside, still immobile. To his relief he sees that the people within are human in shape and behaviour. They all wear tunics. One of the men points what appears to be a gun at him but rather than hurting him it merely frees his limbs so that he can move again. It is obvious that the men are puzzled that the Doctor is able to maintain his shape for more than a few seconds. He steps into their laboratory and tells them that he has travelled millions of light years (sic) to be there but they seem unconcerned with greeting him and merely note that he has the ability to speak - unusual on this planet - before lifting him onto a dais where he is imprisoned behind white bars. He is bathed in a blue light. the men are delighted that they have found someone with a rigid form and think that this may be their salvation. Before they can report their findings, two of the men begin to hideously transform into writhing shapes. The others quickly eject them out onto the street. They are horrified that two of their number have been infected by the contamination and conclude that the Doctor brought it with him. They decide to put him back onto the street. One of them argues that the creature is not one of the Yend. They decide to send him to Formal where he can be dissected. He is taken by a force field to meet Formal, the chief Yend. The TARDIS is in the room, too. The Formal concludes that it is some sort of robot servant of the Doctor's. when the Doctor contradicts him and tries to explain the ship Formal concludes that the Doctor's physical rigidity is balanced by a bizarre mental mutation. The Doctor learns he is on the planet Wengrol. He tries to prove that he is not a native but notices that the chief Yend briefly flickers into a bizarre shape. Formal tells him that no one has ever seen that before but his control is so great he can usually prevent it from happening. He explains that the unfortunate arrival of a star, Mortain, with its poisonous radiations, started this series of mutations several centuries earlier. He adds that this star unfortunately coincided with experiments being performed by the planet's scientists. He asks the Doctor to do him the favour of taking his people to a new home in the Milky way. The Doctor points out that the TARDIS is not large enough but Formal shows him a box of test tubes. Just then there is a shout that the door has been broken and the monsters outside have broken in. as the Doctor races into the TARDIS the horde enter the room. Before he is trampled, Formal throws the box to the Doctor who catches it and shuts the door. As he sets off on his journey he takes out the test tubes and looks at them. All of the embryos are dead. Time-Placement: The Doctor's trip to the Crab Nebula is the farthest the TARDIS has ever made to this point, making it one of the earliest adventures. Likely just after Time and Relative. Putting on his atmospheric density jacket, the Doctor steps out into an alien world. On a misty, rocky plain he finds his mind reeling. Suddenly giant wasp/butterfly creatures descend and put a transparent dome over his head. They say they are Menoptera and are saving him from the Zarbi for their own purposes. They also accuse him of slaughtering many of their people and seem to be proposing to dissect him. They take him into a cave and down to a laboratory. He tells them that he has travelled alone from Earth and this is the first time he has been on Vortis. They reply that they are an advanced party of their kind. Since being driven off the planet by the Zarbi they have lived on one of the moons but are now planning a return to their home world. They tie him to a table where, terrified, he is subjected to an examination. Suddenly, there is an explosion and the Doctor finds himself free to move. He sees a man on a ledge near the entrance. As the Doctor runs to him and climbs a ladder the man sprays the Menoptera with gunfire. The man is eight feet tall and very angry, accusing the Doctor of jeopardizing the mission. He leads the Doctor further into the ground where there is a room full of similar giants. They seem to assume that the Doctor is another kind of insect but his rescuer insists that the Doctor is a man and, to prove it, he strips him naked. The nine giant men grin at him in amusement. The Doctor tells the Captain that he came here in a time and space ship and foolishly allowed himself to be captured. The Captain is amazed. He says that his men and he are trapped on the planet. They did not even know the name of the Menoptera even though they have been here for a year: they merely slaughter them. He asks the Doctor if he can now rescue them with his ship. He does not seem to have heard of the Menoptera's enemies, the Zarbi. The Captain tells him that they are on a ten year mission to conquer the universe but have had some unfortunate adventures. Before the ship crashed these nine men, common soldiers, were all that survived. They have no way of repairing their ship and doubt their ability to return to Atlantis. The Doctor is amazed: Atlantis is nothing but a myth. He pretends that he, too, is on a secret mission for the Supreme Council of Atlantis but set off years before the men. He wonders what time period he is in if these men have only been gone ten years from Earth. They lead him through a hatch in the wall of the cave, which he now realises is the hull of their ship. The craft is enormous and full of highly developed technology. It takes him three days to work out how the ship can be repaired but in that time he has become aware of its immense power to destroy and vows that it must stay on the planet. He lies to the Captain, saying that he must return to the TARDIS to get some instruments. The Captain uses the weapons of the ship to cut a path through the rock to the surface. The Doctor, accompanied by five men, walks across the plain. When they see the size of the TARDIS they assume that they have been tricked and decide to kill the Doctor. Fortunately an army of Menoptera begins an attack on a vast army of approaching Zarbi and the Doctor manages to escape in the confusion. Time-Placement: This is the first visit of the Doctor to Vortis. Two children, Amy and Tony Barker, play hide and seek with their dog, Butch near a copse of trees. They see a police box with the door open and look inside. They conclude that this is actually a space ship but when they step inside they accidentally close and lock the door. When the Doctor returns, dejected that he has landed on Earth in 1966, he dematerializes the TARDIS. When he lands he is sure that the TARDIS is not on solid ground. He grabs a searchlight and looks out of the door but the ship lurches and he is thrown out. He lands on what he thinks are ropes but soon ascertains that the TARDIS has landed in a giant web. He feels that he must be in an enormous cave. When he looks back to the TARDIS, he sees a giant spider, but it cowers away from him when he shines his light on it. He uses the opportunity to climb back up the web to the TARDIS. He quickly loads a syringe with poison that he sprays at the spider. The spider and TARDIS fall from the web. When he re-emerges from the TARDIS, the Doctor notices a door. The door opens revealing a bright light. The Doctor goes through and finds he is in a cage. Grey-skinned humanoids, Sensorites, are watching him. Tony and Amy recover consciousness. They had been hiding under a bench after being locked in the TARDIS. Tony says he saw an old man at the controls but he has gone. The children leave the TARDIS and see the porthole and giant spider. They pass through the porthole and see the planet's two suns - one is setting as the other rises. They set off to look for the old man. They arrive at an amphitheater and see the Doctor strapped to a metal dais in the middle. Butch licks the Doctor's face until he wakes up and realises they must have boarded the TARDIS when he stopped in 1966. The Doctor knows the Sensorites are afraid of both the dark and loud noises, so he tells the children to go into an underground passage where they must make loud noises as soon as he is untied. He waits, growing dehydrated from lying in the heat of two suns. Eventually, the Sensorites return to tell the Doctor he has been condemned to death for killing the Zilgan. Worried that he might kill another of the sacred beasts if they put him back in the cavern, they decide to find another form of execution. They untie him and he starts to shout, as do Amy and Tony. Butch begins to bark, too. The Sensorites flee in panic, allowing the Doctor and his new friends to make their way back to the TARDIS. He tells them that he will take them home. Time-Placement: Before his later visit in The Sensorites. After an abrupt departure from Skaro, the TARDIS's Space Time Locator mechanism is damaged and the Doctor lets his ship go where it will. He lands on a strange planet at night and sleeps until morning. When the sun rises he steps out onto a metal world: there is a strange noise like a throbbing all around him. When he looks into the distance he sees a huge machine, perhaps a giant robot, moving on both legs and wheels towards him. Before it reaches him, however, he is caught by a rope or tentacle and pulled high into the air. He passes out. He wakes up surrounded by some rather scruffy people. On talking to them he finds that they are the Korad and the machine that seemed to be pursuing him was oblivious to him. They call it a Grukker and are astonished that he has not heard of it. The Doctor and the Korad have to shout to make themselves heard over an incessant clanking of machinery. They tell him that their world has no plants or seas, merely machines. The leader of the Haven where the Doctor finds himself introduces himself as Drako. He says that the Doctor will have to stay there until the Wise Ones arrive from another haven. Drako explains that the food the Doctor is now eating was provided by the machines who only allow the Korad to live while they tend to their mechanical masters. Drako asks the Doctor to help the Korad escape before the Wise Ones arrive and take the TARDIS for themselves. Beran, one of the Wise Ones, arrives to interrogate the Doctor. He demands to examine the TARDIS to learn its secrets before it is destroyed. The Doctor angrily argues with him but Beran says that the machine rulers, the Mechanistrians, will not allow machines not made on their world to remain. He says that the machines use human brains and for a Wise One to give his brain for a machine is a great honour: the Wise One accesses the knowledge of all the other machines and also becomes immortal. Drako takes Beran's atomizer gun and leads both him and the Doctor to the soarer aircraft that can take them to the TARDIS. After they take off, Drako forces Beran to jump out. He then waits for the aircraft to land before turning the gun on the Doctor. He orders him to use the TARDIS to go back to a point in history before the Mechanistrians ruled. The Doctor agrees and they travel back ten million years. When they open the doors, it is to a world of plants and grass. There are clouds in the sky, unknown by Korans for millennia. Drako says he will now try to do his best to prevent the rise of Mechanistria. He tosses the atomizer gun back into the TARDIS. the Doctor leaves on his next journey, wondering whether it is possible to change Fate. He notices that the gun is no longer on the floor of the TARDIS and speculated that Drako succeeded in his task. Time-Placement: There are references to the Daleks, but since the Doctor never heard of them prior to The Daleks, this adventure must takes place afterwards. According to the short story The Rag and Bone Man's Story, the 1st Doctor is said to have travelled alone for a time before coming back to pick Dodo at the end of The War Machines. The TARDIS materializes under an ocean and the Doctor watches enormous fish on his screen. He is astonished by them and decides to investigate further. To do this he manipulates the TARDIS controls a few thousand miles. He lands on a stone causeway that stretches out across the sea. It is lined by pillars and rectangular trenches which are filled with water. Each of these contains a man-shaped creature but each has gills and scales. At first he thinks they are dead and their pits are graves but a horn blows and the Fishmen wake and begin to climb onto the causeway where they line up in ranks like soldiers. Another horn blows and a large ship like a flying barge lands on the sea near the causeway. The occupants of the barge appear to be totally black. The Fishmen enter the water and swim toward it. The Doctor is too far from the barge to see its occupants clearly but is disturbed by them, as if he has seen them before. As the Fishmen swim out, the barge ship flies just above the surface of the ocean and the Fishmen follow through the water. The Doctor feels suddenly lonely and cold. He returns to the TARDIS to rest and eat. As he does so, two suns rise and cross the sky. As they finally begin to set, the barge and the Fishmen return. He steps out of the TARDIS to watch as the Fishmen clamber back into their pits. Then he recognizes the black creatures on the barge as the Voord. He wonders if he is on Marinus, millions of years in the future or the past. Suddenly the barge accelerates and hovers between the Doctor and the TARDIS. Four Voord leap out and grapple with the Doctor, taking him onto the barge which now moves away from the causeway. One of them addresses him, saying that they have legends of people like him who expelled their kind from Marinus. They chain him to a mast and offer him raw fish. He yells out in frustration which alarms the Voord. One of them tells him that loud noises are harmful to his species. The Doctor decides to store this fact for use later on. He assumes that they are communicating with each other telepathically, using the horns on their heads. The ship eventually lands on top of a large artificial dome. The Doctor is led down steps into the dome. It is pungent with the stench of fish and seems to be made entirely of bare concrete. The spokesman of the Voord tells the Doctor how a few hundred of his people survived the defeat on Marinus and were packed off in a space ship to find a new home. When they arrived here on Kandalinga they struggled to survive. They enslaved the Fishmen and are using them to help in reclaiming land from the sea. Once the Fishmen have served their purpose they will be destroyed. As it is, they are already being used as a source of food for the Voord. When the Doctor objects to all of this the Voord points out that the slaves are only fish. He says that the ultimate goal is to return to Marinus for their revenge on the Arbitans. The Voord asks the Doctor where his ship is, and says they can use its engines and equipment to help them achieve their goal. the speaking Voord opens a case and takes out two of the Keys of Marinus. The Doctor knows that these can be used as travel devices to move between different places on the planet. The Voord demands to be taken to the Doctor's ship. After seeming to disagree with this plan, the Doctor acquiesces and allows one of the keys to be put on his wrist. As the Voord manipulates the controls he tells the Doctor that the other Voord are like cattle and, without his leadership, would soon be defeated in the frequent uprisings of the Fishmen. When the co-ordinates are entered the Doctor finds himself back on the causeway beside the TARDIS. The Fishmen are just emerging from their pits. As the Voord arrives behind him, the Doctor snaps off the telepathic antenna. Without it, the Voord is unable to sense the world around him, nor can he control the Fishmen. They soon overpower him while the Doctor returns to the TARDIS. Later, he sees the small crew of the barge similarly overpowered by the Fishmen and reflects that the natural order has been restored and the cruel Voord will no longer rule the planet. Time-Placement: According to the short story The Rag and Bone Man's Story, the 1st Doctor is said to have travelled alone for a time before coming back to pick Dodo at the end of The War Machines. The Doctor is reluctant to leave Earth, 2067, but when he lands it is in an almost identical landscape of grass and clouds. He soon learns that the air is too thin to breathe and puts on an Atmospheric Density Jacket. He finds himself attracted to the low-lying, incandescent clouds but when he tries to take a sample from one it folds around him and he passes out. He wakes to find himself lying paralysed on a table in a laboratory. Several clouds are watching him. He shouts at them to free him but finds that the clouds are sensitive to loud noises. One of the clouds explains that they are the Ethereals. Previously, they had been humanoid until they invented a robot race, the Baggolts, who rebelled and overthrew them. The robots tried to vaporize the Ethereals but only managed to turn them into clouds. The laboratory contains an epitomiser, a device that will turn the Doctor into a mould for new humanoid bodies for the clouds. Unfortunately, the Doctor will die as a result. He lets himself be taken to the cubicle, where he correctly guesses that the paralyzing force will no longer be effective. Once inside, he uses his super ring to unlock the cubicle. He yells to drive off the Ethereals, then rips the wires out of the epitomiser. Without apparently bearing a grudge, he offers to make their equipment return the Ethereals to their former shape without need of a mould. He works long and hard at this task until, one after another, he has made the clouds human. The Ethereal leader, Mitzog, offers to step down in the Doctor's place. The Doctor turns down this offer but insists on helping them overthrow the Baggolts. He suggests that they build themselves robot suits to enter the Baggolt fortress in disguise. They surprise and overpower a robot working party and enter the capital city, Droog. Using the Doctor's egolectascope to disable the alarm systems, he and Mitzog break into the control centre. The Doctor produces rubber suits from his pocket which the two of them wear to pass through an electric trap and Mitzog leaps onto the back of Nalog, Chief of the Robots. 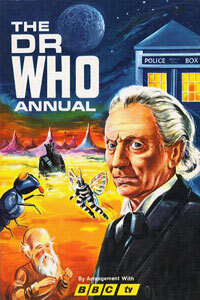 As they struggle the Doctor locates the master panel, containing a single switch. He turns it from 'Rebellion' to 'Peace'. Mitzog promises the Doctor that he will be enshrined forever in the Annals of the Ethereals. Time-Placement: In publication order after the last stories of the Annual 1966. When the Doctor looks at the scanner after landing he sees a pig's head filling the screen. This turns out to be one of a number of dishes being carried by a robot. The Doctor steps out into a wide corridor hung with tapestries. He makes his way to a gallery above a banqueting hall. He notices a figure in black further along the gallery, aiming a weapon at the men feasting below. He strikes out with a stick and the figure escapes. a robot catches the Doctor and takes him down to the men at the feast who accuse him of being a spy for the Crustians. He denies this and says that he is a traveller from another world The men, the Sons of Grekk, don't believe him and laugh at the TARDIS. The eldest son, Swarf, warns that it may be dangerous, and tells his brother Morag to take the Doctor to the Pit. Meanwhile robot Mechanislaves, stand guard over the TARDIS. The Pit is a smooth-sided volcanic crater. Various other prisoners are within, including a large spider. When the Doctor is pushed into the pit he is saved by the spider's web. The other prisoners include creatures that remind the Doctor of cockroaches, butterflies and turtles. The turtles are Crustians. It is one of these who explain that the assassin is Deemon. This man was left on the planet by Grekk to maintain his son's antagonistic relationship with all other life forms. The Crustian has managed to smuggle a device for providing sustenance into the pit: this is all that keeps the prisoners alive. the Doctor is able to convert the unit into a transmitter to tell other Crustians where to come to rescue the prisoners. The Sons of Grekk intercept the signal and go to the Pit to massacre the prisoners but the Doctor has laid a trap using the spiders' webs. The Sons are trapped and the prisoners climb up the Sons' ladders. The Sons are left to contemplate their actions. The Doctor and some of the prisoners return to the Sons' castle but Deemon has reprogrammed the Mechanislaves to attack. The Doctor pretends that his stick is actually a gun, and tells Deemon to order the robots to stand down. Just then he sees other Mechanislaves are preparing to throw the TARDIS out of a high window. He manages to climb up and into the TARDIS and dematerialize before it hits the ground. The space-time computer was damaged in hid escape from the Sons of Grekk so the Doctor has to spend some time repairing. To check that it is working properly he makes a return journey to Tiro. The last time he was here he saved Argon and his amphibians, the Staggs, from the invasion of Outerfringe Forces. After landing, he consults his maps and finds that he is on the wrong side of the Alloy Mountains. When he tries to hop the TARDIS over it merely rumbles and does not move. He diagnoses a Klister valve failure. He looks at the defective valve and sees he needs to replenish the Magnatite. Alas, he has none on the TARDIS. Only Argon can help him. Thus, he sets out to trek over to the other side of the mountains. On the way he has to fight off a carnivorous bird but trips over a creeper and knocks himself out. He wakes up inside a giant carnivorous poppy and has to cut himself free. He sits down to rest by a deep pool in a clearing and is amazed to see some Staggs swimming across the bottom of the pool. He shouts but they do not hear him. When he looks round he realises he is about to be ripped to pieces by one of the slow-moving hunter trees. He decides to get out of the forest as quickly as possible. He is so tired when he does so that he decides to sleep among the leaves of a giant cabbage. However, when he is woken in the night, it is to realise that the cabbage is rolling down a hill. When it comes to rest he steps out, only to see that the cabbage has been collected by a giant ant and rolled into a cave. Another ant spots the Doctor and he has to dodge its attack and run for his life down a side passage that is too narrow for the ant to follow. At the bottom of the passage he hears a scream from another tunnel. As he investigates he is taken prisoner by some Staggs. One of them is Argon, who recognises him. He leads the Doctor to a cave where they see a Stagg body. From an opening, a great molten ball emerges, growing rapidly in size, which then shoots at the Doctor with some sort of ray gun. The Doctor dodges the ray and the sphere disappears. Argon tells him that the sphere was Klarimo, the leader of the invasion that the Doctor helped to defeat. Everyone thought that Klarimo had left in the Molecular shaft, but it seems he stayed behind to poison the Staggs' water supply. The Doctor suggests that Klarimo may have been left behind when the Shaft malfunctioned. He proposes that they blow the top off the volcano in which they are hiding. The Staggs do this and see Klarimo disappear with a blinding flash. Relieved that their problems are solved, the Staggs ask how they can repay the doctor. He shows them his Klister valve and asks for some of their Magnetite. The Doctor lands alone on the planet Birr, but finds it barren: the Verdants have gone. He is taken prisoner by humanoid aliens called the Rostrow and led to their space ship. Their leader, Lahk, says that if he is as clever as he claims he should be able to repair their ship so that it can take off. An engineer, Duh, takes the Doctor through the ship. On the journey he sees some Verdants in glass cases. Duh thinks that they are plant specimens but the Doctor points out that they are the inhabitants of the planet. Once some of their kind had been taken prisoner the other Verdants withdrew below ground and created a force field to stop the ship leaving with their kin. The Rostrow must make contact with the Verdants and apologise for their actions if they wish to leave. The Doctor accompanies Duh to the entrance of the Verdants underground dwellings. They are soon wrapped in tendrils and approached by the Verdants' executioner (a large flower). The Doctor tells Duh that the Verdants hate loud noise so they shout until the Verdants are driven off. As the Doctor and Duh run away the engineer is hit by a well flung barb but his protective suit saves him. Eventually they reach a cave where they meet Phlege, the Verdant leader. The Doctor explains the mistake and Phlege is very forgiving. The Doctor says his only reward is the friendship of two races as he returns to the TARDIS. After landing in a misty swamp, the Doctor looks at his scanners to see the landscape of the planet where he finds himself. He sees a cratered plain beyond the swamp and, far off in the distance, huge mountains glittering in the light of the twin suns. Above the mountains he sees huge birds circling. He produces a small cushion craft of his own invention to navigate the swamp. When he steps out of the TARDIS he realises that he has landed on an island made entirely of bones. He crosses to solid land and leaves the boat on the beach. He hasn't walked far when he comes across a gigantic footprint. Beside the print is a huge sword. As he grasps the handle he is paralysed and a voice in his mind tells him to look at the sword. He gazes at the broken blade where he sees the reflection of a face with malevolent eyes. The face demands to know what happened to Lohk and hiss army. The Doctor suggests that they are now a pile of bones. The face accuses the Doctor of being Ulla, the master of the Devil Birds. Before he can protest, the Doctor becomes aware that one of the birds is swooping down on him. He flings himself to one side and plunges down a slope. The bird drops on him and is a split second from killing him when hands pull him under an overhanging rock. The bird hits the ground with a thump and then soars away. The Doctor looks at his saviours and sees that they are two pale faced children. They are twins: Dot and Jack. They tell him that they are the children of Harroll Strong. He is the leader of an Earth-Mars expedition looking for mineral deposits on this planet which they call Corbo. No sooner had the ship landed than it had been immobilized by a magnetic field. Their father had taken a party of men to seek out the magnetic source while the remainder of the crew, including the children, had gone to look for crystals. No sooner had they set out than they found themselves in the marsh, watching an army of green-skinned men being destroyed by a flock of giant birds. The children were put under the overhang while the men tried to fight off the birds with ray guns and heat cannons. All had been in vain as the men were taken, one by one, and flown away from the battle site. The Doctor surmises that the green men were aliens from another planet and that the face in the sword was their leader, still in the space ship with the rest of the invading army. He also thinks that the sword is some kind of nuclear weapon. He tells the children all of this but Jack asks why the birds can't be killed and who Ulla is. The Doctor decides to find some answers and they make their way to the vast crystal cliffs. When they get there a door opens in the cliff and they follow a stairway up into the inky darkness. They arrive in a cavern where they see ranks of the devil birds. All are motionless and are being attended by dark figures covered in feathers. The Doctor realises that the birds are actually robots. Suddenly a platform rises from the floor. On it are Ulla, the birdmen's king, and four human astronauts. The children recognise one as their father. The king orders Strong to kneel and another birdman steps forward with a captured sword. He is about to behead Strong when the Doctor steps out of the shadows, telling the executioner to halt. The sword is pointed at the Doctor but with his casual arrogance he uses his walking stick to knock the sword away. He helps Strong to his feet. The astronaut tells him to look around: all of the other birdmen are pointing ray guns at the party. 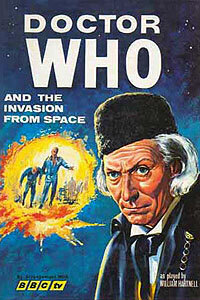 The Doctor tries to explain that he is a friend, a traveller in time and space, but Ulla accuses him of being a spy. He picks up the sword and swings it down on the Doctor to cut him in two. The Doctor uses his stick to trip Ulla and Strong picks up another guard and throws him at the remainder. All of the birdmen are on the floor when a warning is announced that an enemy attack is beginning. Ulla loses interest in his prisoners as he launches his birds through a gap in the wall. The Doctor frees the other astronauts and the whole party, including the children, leaves the chamber. As they reach the outside they see a full scale battle between the green skinned aliens and the robot birds. They make their way back to the swamp and cross to the island in the Doctor's boat. Just as the Doctor is bundling the last of the astronauts into the TARDIS, Ulla sweeps out of the skies. The Doctor gives the bird-king a thwack with his stick and then steps into the TARDIS where he sets about plotting a route back to Earth. After leaving Corbo, the Doctor lands the TARDIS on the planet Rhoos. They materialize on a grassy plain full of what seems to be tall grass. The Doctor leaves Harroll Strong and his children aboard the TARDIS while he and the other three astronauts try to walk through the grass. Finding it impossible they return to the TARDIS where the Doctor locates contra-gravity suits for them. They are thus able to hover above the grass. In this way they discover that they are on the arm of a one-eyed (and very hairy) giant. As the Doctor and his companions (Hill, Shelley and Chertzog) fly around they are taken aboard a needle nosed space ship. Once aboard they are told to remove their flying suits and drop their weapons. The Doctor points out that they are not carrying any weapons. They make their way onto the flight deck and meet the crew. These are three hen-like aliens (featherless but wearing uniforms) who want to know why the men were hovering above Fo, the giant. Looking at the viewfinder, they realise that the giant has woken and gone. The ship enters a base hidden in a mountain and the travellers are taken to meet the leader of the Kaarks. They are natives of Rhoos. The leader says that Fo was seen carrying a small blue box. Apparently, Fo is a renegade from the Black Galaxy who crashed on Rhoos and has been slaughtering the locals ever since. That is why they have taken to hiding underground. The leader says that Fo has snatched many Kaark scientists and used them to construct defences for his base. Nevertheless, the Doctor and his human friends insist on taking a scout ship to investigate this base. The leader assigns Ff'ni to pilot them. The ship is brought down by a tractor beam and Fo rips the roof off. He deposits the crew in a model town that he has built. They make their way through the streets until they find the arena where Fo makes his prisoners fight a variety of wild beasts. They soon find the TARDIS and quickly enter. Strong and his children greet them warmly and all of the humans ask to leave the planet but the Doctor says he must stay to help the Kaarks. He sees that Ff'ni has been captured and is about to fight a leopard. The Doctor approaches the big cat and growls in the back of his throat. The leopard cowers in terror until the Doctor strikes it with his cane and it flees. Fo tries to squash the Doctor but he has brought a black box from the TARDIS. As the giant's hand descends, the Doctor opens the box. There is a blue flash and a smell of ozone. Fo drops down dead. The Doctor and his friends set off back to Earth. Time-Placement: Follows directly The Devil Birds of Corbo. The TARDIs brings the Doctor to a frozen planet beyond the G-star in Ambivalence Five. After putting on his atmospheric density jacket, he steps out to survey a huge glacier through his binoculars. He sees a man speeding down a distant slope, pursued by four others who are firing energy beams at him. The man skids off the snow and onto ice, heading towards a crevasse. The Doctor puts on his Zero Boots (his own invention - a combination of ski, snowshoe and crampon) and grabs a rope. He slides down to the lip of the crevasse and peers in to see the man lying about ten feet below him. The Doctor carefully steps out onto a slender snow bridge. The man below is recovering consciousness so the Doctor ties the rope around a boulder and lowers the end. What climbs up is a man with a body covered in hair but a face devoid of fur. He tells the Doctor to command him, since he has saved his life. The Doctor refuses the offer and introduces himself. In return the man gives his name as Grahm and the planet's as Bruhl. He says that he was being pursued by the police for stealing a thought cube. He protests his innocence but says that since Rraprro became the Wise One of the Glacians there has been no justice. The Doctor tries to get Grahm back to the TARDIS but they are arrested by the planet police who say that the Doctor must have something to do with the theft of the thought-cube. The snow bridge is destroyed in the process and the way to the TARDIS is cut off. They walk across the snow until they come to a wall of ice. One of the police twists an icicle in a certain combination (which the Doctor notes) and the door opens into the City Under the Ice. They are marched through busy streets of a fantastical city until they reach a building of large proportions. Inside, on a dais, sits a Glacian in a golden robe. This is Rraprro. He tells Grahm that he will be put to death by icicles and then turns his attention to the Doctor. He is interested to hear that the Doctor has a space ship but is annoyed that it cannot be reached. He orders the police to rebuild the snow bridge. 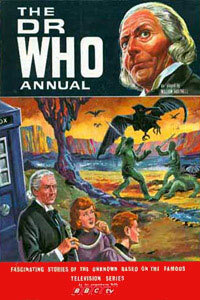 The Doctor and Grahm are locked in a cell where Grahm explains a few things: the thought cubes are the Zilgor's equivalent of books; the Zilgors are an alien race, six of whom arrived on the planet centuries earlier and helped to advance the Glacians' society; the aliens all vanished one day and Rraprro was found on the throne saying that the Zilgors had made him the ruler in their place. Grahm adds that Rraprro seems to be afraid of a rebellion against his repressive regime. At that point, a Glacian cuts through the metal wall with some heat equipment and ushers Grahm and the Doctor out of the cell. They are introduced to several other Glacians, including Ffreuf the scientist. He says that he stole the thought cube because it may contain the reason why the Zilgors left. Alas, he has not yet discovered how to read it and hopes that the Doctor may help. They escape in a waiting vehicle and drive to a deserted part of the city. Inside one of the buildings, occupied by rebels, is a Zilgor laboratory containing the thought-cube. The Doctor gets the Glacians to retrieve a glass couch from the rubbish heap, telling them that it is the way to decode the cube. Then he lies on the couch and concentrates for a few minutes. Afterwards he can inform the Glacians that the Zilgors are still on the planet, entombed in ice. They put themselves into a trance to endure the severe temperatures and they can be found in Mura Six. As the rebels prepare to march on the cavern to rescue them, Grahm says he will lead the Doctor back to his TARDIS. They drive out to the snow bridge and then leave the car. As they reach the police-box, some of the police patrol open fire on them. The Doctor manages to scramble inside and looks at the screen. To his delight he sees the police fleeing from a party of rebels, led by Grahm. The Doctor is grumbling to himself after the TARDIS materializes ten fathoms below the sea. As he watches the scanner he sees a party of men in underwater suits approach. They are carrying sonic pistols as well as knives and cutlasses. One of them has the skull and cross-bones on his back. The men throw a net over the TARDIS. The Doctor decides to dematerialize the TARDIS but this causes the control panel to burst into sparks. He concludes that the net is actually an energy field. The TARDIS is transported to an underwater dome and, via an entrance tank, deposited on a conveyor belt. The TARDIS is taken to an office where three men sit beside a desk. On of them, dressed flamboyantly in gold, seems to be their leader. As he steps out of the TARDIS a dozen guards point their weapons at him but he tells them he is unarmed. He explains that he is a space-time traveller. The chief asks to look in the TARDIS so the Doctor feigns his inability to unlock the door, claiming that the tumblers in the lock must have been damaged by its rough handling. The chief asks what he needs to repair it and the Doctor asks for a Renticular Celluprime Number Two. The pirates have no idea what this is (not surprisingly, since the Doctor has just made it up). The chief tells him that they are about to go ashore to attack the Secretariat building in order to rescue some of his men. He says that the Doctor can accompany them because every type of tool can be found there. after a meal, the pirates set out in undersea scooters that carry three men each. On the way there, the Doctor learns that the pirate base is mobile. When they reach the shore they disembark and run towards the Secretariat Building. They use their stun guns to freeze the Landlubber Guards and enter the building with the main pirate force. In the store room the pirates check the computer for the Doctor's imaginary tool and, naturally, fail to find it. They turn their guns on him but don't notice a guard behind them. He shoots one of the pirates and grapples with the other. The Doctor takes this opportunity to sneak out of the building as it bursts into flames behind him. He has just got into the sea-scooter when the Secretariat collapses. He steers away from the falling wreckage, just in time. Using the auto-pilot, he returns to the pirate base and sneaks back to the TARDIS. The base is empty apart from a few guards. One of them almost catches him as he steps into his time ship but he manages to shut the door safely. As he sets the controls to depart he makes a note that he should never leave home without a Renticular Celluprime Number Two. The TARDIS is bucking about in the energy fields of the universe, making the Doctor feel queasy. He looks at the passengers and thinks that they are taking it well, all things considered. They are the Mortimer family and, having been rescued from the Great Fire of London, are prone to calling him 'Warlock'. He chastises them for this and tells them that he is a Doctor of science, and that despite their fears he was not sent from the devil to pull them out of their burning shed. George Mortimer seems convinced but his wife, Helen, is thankful that her two children are sleeping safely though perturbed by the identity of their saviour. She is less than mollified when the Doctor irritably insists that he landed in their hovel by accident and had no intention of rescuing them: they blundered into the TARDIS as they evaded the flames. The TARDIS lands and the Doctor tells them that he will deposit them back in England though he doesn't know when. Privately he doubts whether he is in England and notes that one day he must fix his navigation systems. He tells them that he prefers travelling alone. When the door opens a bright sun shines in and he finds dark glasses for them all to wear. However, when they step to the door it becomes apparent, to the Doctor at least, that the light is coming from a vast constellation - Andromeda - that fills the sky and which makes the Mortimers think that they have arrived in Heaven. This is reinforced by the six figures walking towards them who resemble angels. They are blonde and wear silvery suits. They smile and welcome the visitors, calling themselves Aalas. They say the One is waiting for them. The Doctor wonders why the Aalas call him and his passengers 'Men' when they appear to be men, too. Gathering the four Mortimers together he follows the six figures to an aperture in the surface where some steps lead down. He realises that he has landed on a vast spaceship the size of a planetoid. As they make their way through the corridors and elevators of the ship the adult Mortimers grow increasingly terrified while the children become more excited and interested in their surroundings. They arrive at a small metal room where they are left by their guides who say that food and water will be provided. The Doctor assumes that they are prisoners. He then notices a panel on the wall and when he approaches it a voice speaks to him as random lights flash. The voice seems to belong to a creature that assumes itself the ruler of Andromeda. The Doctor regards the speaker as a madman. He refuses to give his own name but introduces the Mortimers. The voice says that it has a deep regard for Man and has many legends concerning their great deeds but is disappointed to have found five such inferior representatives. It says that when it brought down the ship it could have been of use but now it doubts it. The Doctor speaks dismissively of the Mortimers, saying only that they are peasants who he rescued from burning to death. He brags about his own knowledge and the capabilities of the TARDIS. He adds that the Mortimers are from Earth. He also demands that the speaker show himself. In response, the voice ponders that these men are his ancestors from millions of years ago and says that the Diagrams are not complete without Man. It tells him that the TARDIS will be brought inside. When the voice ceases speaking the Doctor angrily grabs at the panel but receives a tingling shock in response. One of their guides, or someone who looks like him, appears and tells the Doctor that the audience is over and when the One have more questions they will ask them. Angrily, the Doctor demands to know who the One is or are. The Aala merely leads them in silence through more corridors. On their way they pass many other Aalas, smiling mindlessly and carrying equipment that the Doctor has never seen before. They arrive in a room with couches and a table laden with food. When the Mortimers fall on the feast greedily the Doctor warns them to check what they are eating but Helen says that they have not eaten for three days. The Doctor tastes the food and finds it pleasant. He is mystified when the Aala tells him that his people only feed on electricity. He says that they are servants of the One and are being led to the Milky Way where they will be able to vary their diet by feeding on radioactivity. The Doctor realises that these are air-breathing androids. The Aala adds that they were created in the image of the One who was created in the image of the imperfect men of Andromeda who lived millions of years earlier. He says that the Doctor and his companions will become part of the culture that is intent on invading the Milky Way. The Doctor concludes that he is on a ship run by a mad robot leading other mad robots. When the One demands that the prisoners be brought to it the Doctor refuses until more androids arrive and take them by force to the previous room where the TARDIS now stands. The Doctor is annoyed to find his ship door open and the TARDIS full of Aalas. The voice says that it has examined the vessel and sees that it is a time-space ship, inferior to its own technology, but it cannot work out how to make it work. The Doctor says that the TARDIS will only travel with him at the controls for his spirit is a key part of its being. The One demands a demonstration but the Doctor refuses. George Mortimer pleads with the Doctor to do as he is asked so that they can all go aboard and escape but Helen notices that her children, Alan and Ida have gone. The Aalas all become inert as the screen flashes random lights and a piercing whistle is heard. When everything calms down it is apparent that the One was disconcerted by having been contradicted for the first time in ten hundred million years. It concludes that this might not be a bad thing. It adds that with replicas of the TARDIS it could invade the Milky Way in seconds rather than the three hundred million years it estimates its journey will take. The Doctor at first refuses but then relents, secretly deciding to keep the creature talking while he finds out as much about it as he can. The One says that it knows this is his plan and that he will have to give up the secret eventually. The Doctor sees that all of the Aalas have left the TARDIS and runs in through the door. He sets the ship in motion. He has two thoughts: first, a pang of guilt for leaving the Mortimers that he soon overcomes and, second, a sense of disbelief that his TARDIS could have been brought here by the One. Alas, when he looks at the screen he finds that he is not millions of miles away as he hoped, but held above the ship. Using all of his skill he wrestles with the controls and seems to break away from the planetoid only to find it but one among millions on the same voyage. The others do not seem to have Aalas on them: some are inhabited by lizards or gas creatures, others seem devoid of life. After a mind-numbing journey across the fleet he finds himself back in the room he started from with the doors open. He concludes that he has been brought back but the One tells him that is not the case. The Doctor had, in fact, escaped though the One did not doubt that it would find him and bring him back eventually. It concludes that the Doctor brought himself back even though he denies this. It then tells him that he will be made immortal, or at least his brain will, so that he can aid the One forever. It fills in some details about the invasion: Andromeda is plunging into a void of Nothingness that will obliterate it completely and the life forms of the galaxy need a new home. Mortified by the concept of being reduced to an immortal brain, the Doctor tries to speak of the Diagrams that the One mentioned earlier, but it refuses to bargain with him. Instead it talks about its fascination with his companions, not least because on e of them is a woman and two are children. With a flash of self-knowledge, the Doctor realises that he returned here of his own accord to rescue the Mortimers. The Mortimer parents are brought into the room. Helen is weeping and George is angry and afraid. They both fear being cut open. Worse, they fear what will happen to their children. The Doctor demands that the children be brought as well and says that once the five are reunited the One can kill them. The voice replies that the children are being studied. It has been millions of years since it had the chance to see the behaviour of emotional beings. However, it says that the adults are free to go into the TARDIS and that the children will be brought. After this sign of good faith it tries to talk with the Doctor again but he says he has nothing to say to a creature that sees the universe on the scale of galaxies whereas he views it in terms of people. However, he knows that by talking of the oblivion facing Andromeda the One was trying to work on his sympathy. He replies that the ultimate heat-death of the universe will see an end to all life, even that which thinks it is immortal. As he talks he ponders on the One's inconsistent use of 'I' and 'we' when referring to itself. Just then the children are returned to the room. The Doctor tells them to get into the TARDIS so that they can leave but Ida is carrying a bowl which contained jelly and she demands some more before she goes anywhere. The voice comments that androids are a simpler way of populating the world than children. This angers Ida into throwing her bowl at the screen. This simple act has a remarkable effect. The Doctor reflects that the outpouring of irrational emotion must have been enough to send the One insane for it begins to jabber incoherent streams of equations and orders in a voice varying from a whisper to a scream. The Doctor approaches the panel and sees the Diagrams of all knowledge disintegrating. He thinks of the fleet, now leaderless, speeding through the cosmos for millions of years with no sense of direction. He turns to Ida and tells her that she saved the galaxy. She says that it is a pretty word but she does not know what it means. She adds that she preferred London in the fire to this place and asks to go home. Before they enter the TARDIS they look at the inert Aalas. When Alan pushes one it collapses to the floor. They enter the TARDIS and shut the door as the Doctor sets the controls. Time-Placement: Arbitrary, in publication order after the last stories of the Annual 1966. Notes: This is a 60-page illustrated novella published by World Distributors. It is implied at various points that the Doctor originates from Earth. However, it also suggests that the TARDIS controls are isomorphic (the first reference to this in any story I have seen or read) and that the TARDIS follows the Doctor's subconscious desires when picking its destinations.